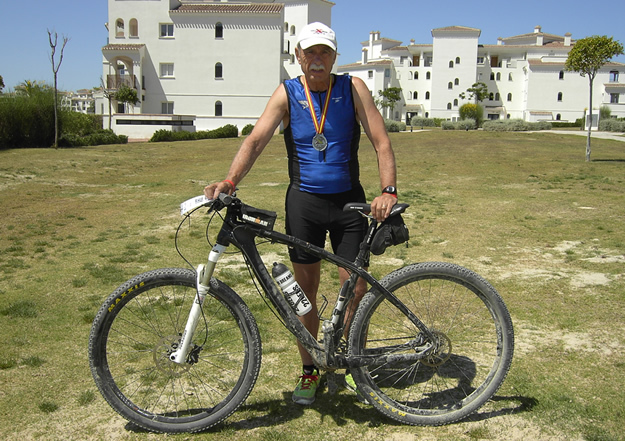 Resident 'Jet Set Super Vet' (JSSV), Stuart Lumb has been travelling again and this time it was a visit to XTERRA Spain. As always with a Stuart trip, not without incident. As often, Lanterne Rouge in the race... but he still had a rather hefty trophy to take home with him. On-road triathlon is very much the in thing these days, maybe on the back of the success at the Olympics of two brothers who also just also happen to hail from God's Country! Seemingly the GB team for this year's ITU events in London in September will total over 1000 athletes and we saw at Liverpool huge numbers chasing seven cherished slots for the Worlds. In contrast Cross, or Off-road triathlon doesn't seem to have quite the same kudos. Having said that, this form of triathlon has its dedicated followers with this year seeing the third ITU World Cross Triathlon Championships being held over the energy-sapping sand dunes and beaches of Den Haag. 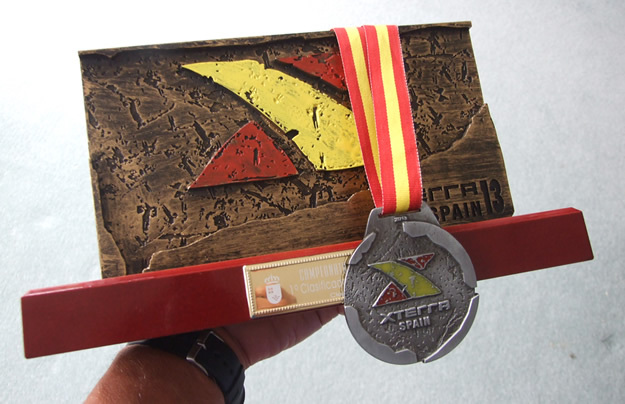 It's also very heartening to see the welcome return of the XTERRA series to England this September after a break since 2008 (a race I shall never forget as it bucketed down from start to finish, which in my case was a very very long time... nowt new here I should hasten to add). My race philosophy / modus operandi has always been as long as it's legal go for it, as I always need as much help as I can get, to make up for my many shortcomings as a now Vintage racer. Lots of guys now race on 29ers so I decided to splash out on a new steed, much to Mrs JSSV's horror. Planet X / On-One make some fabulous bikes and their base is only an hour's drive away from my home so I duly visited them and came away the proud owner of an On–One carbon fibre Lurcher hard tail. Rod at Freetown Sports in Hull (www.freetownsports.co.uk ) helps me a lot and hence the original tyres were replaced with Maxxis boots and slimed tubes. Prior to leaving for Spain I allowed myself plenty of time when it came to boxing my bike and in fact it was just as well, as I had to take the tyres and tubes off the rims to get them to fit into my SciCon box lid. 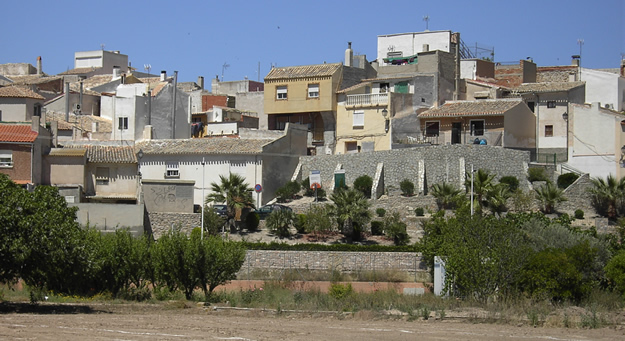 The weather in Spain in late May had been unseasonably cool this year, but things warmed up shortly after we arrived. JSSV race trips are never uneventful – I now know the Spanish for tyre levers! Another slight hiccup occurred as we drove to the race venue to do a recce. We had literally driven 100m up the road when there was a deafening bang – my poor wife thought we'd been shot at , but fortunately it was nothing quite that serious. The rear interior of our hire car was splattered in vivid green goo- yes, you've got it in one – my Lurcher rear tube had overheated and burst, forcing the tyre off the rim and covering everything with slime..ugh ! I naturally had spare tubes (and tyres), but no extra slime. God only knows how that translates into Spanish - so I just hoped I'd get by without needing it. Because of the nature of XTERRA / Cross Tri racing the events are usually held in quite remote places and so it pays to take a good selection of spares along as bike shops can be pretty few and far between.We eventually got to Cieza, to suss out transitions and cycle some of the race route, to get a flavour of things to come. Close by was a huge peak, soaring into the sky, which, I was informed to my horror, was to be climbed as part of the “run”. Next day we registered, followed by the race briefing which didn't take place until 10pm – well, it was Spain... This troubled me somewhat as we were staying some distance from the race - I was told pointedly by my 'manager' to "book nearer in future". The swim (two laps of 750m), was in a dam and because access was limited we were all bussed out, the bikes having already been shipped out there before our briefing. My swim went ok and then astride my trusty new On –One Lurcher,wearing my Bell helmet courtesy of Danisco, it was off on the 32k bike split. The scenery with xtri races is always stunning which makes up for the fact I'm invariably “tail –end Charlie” and racing in glorious solitude. By mid bike split it was hitting 26°C so getting quite warm, and keeping hydrated was a problem. My Lurcher was great to ride plus it's easier to push than my Anthem – a key aspect of my racing technique! As usual the organisers sent out a minder to keep tabs on me – in this case a guy on a noisy two stroke trials bike – and he duly tailed me through to T2, where I gratefully racked my Lurcher and pulled on my nice light Saucony Progrid Kinvara trail shoes, (thanks again to Danisco). The 10k “run” involved climbing and descending constantly, so it was tough going. At the top of the climb I was given another minder, this time on an mtb. His English was far better than my Spanish and having his company was a big help. About 500m from the finish my left hamstring cramped big time – as usual my pre-race training programme had been disrupted by a number of niggles – “taper” is not in JSSV's vocabulary – so I put the cramp down to the heat and lack of endurance training. Anyway, I hobbled in to the finish and was given an amazing reception by fellow athletes and their families, which words can't describe. Lanterne Rouge as usual, in six hours three minutes and 40secs. The 40secs were most important! 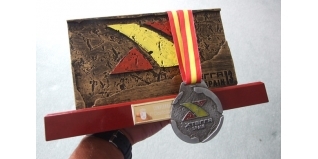 I was given an attractive finisher's medal as I crossed the line and an even more stunning Age Group trophy, made of bronze and which weighs 1.5kg. A lethal weapon, no less! 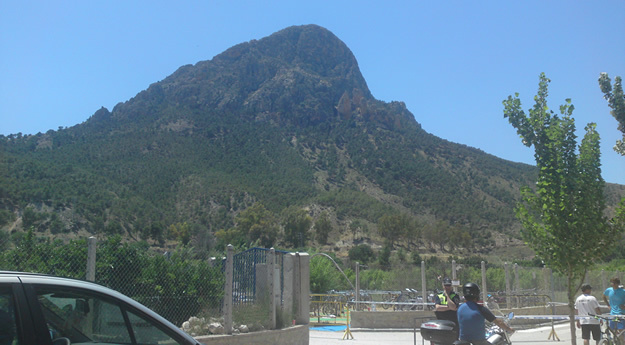 This was a new location for XTERRA Spain and Dave Nicholas and his Spanish team did an ace job in terms of great organisation and delivery. It was a very tough race but then you expect nothing less from the cross triathlon discipline.